A beautifully illustrated anthology, with a selection of poems and poets. All poems are chosen to show children how inspiring and magical poems can be, making it a perfect introduction to the world of poetry. From bouncy limericks to beautiful nature poems and enthralling stories, every kind of poem is here for children to enjoy again and again. 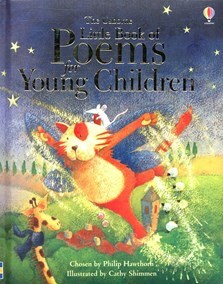 Poems for children should be strong on visual appeal too. Children’s poetry is generally illustrated, especially that for younger children, which greatly increases the sensuous impact of the poetry book on the reader. Pictures by Masumi Farukawa, Cathy Shimmen and Kristina Swamer add to the enchantment of three collections of children’s poetry from Usborne: Poems for Little Children, Poems for Young Children and The Usborne Book of Poetry.